That's what I might have heard shouted around me, if at midnight I'd been out and about KL, instead of in bed at home, asleep. Today's Merdeka Day, Malaysia's birthday. This year is number 49, which means the celebration next year should be a doozy. 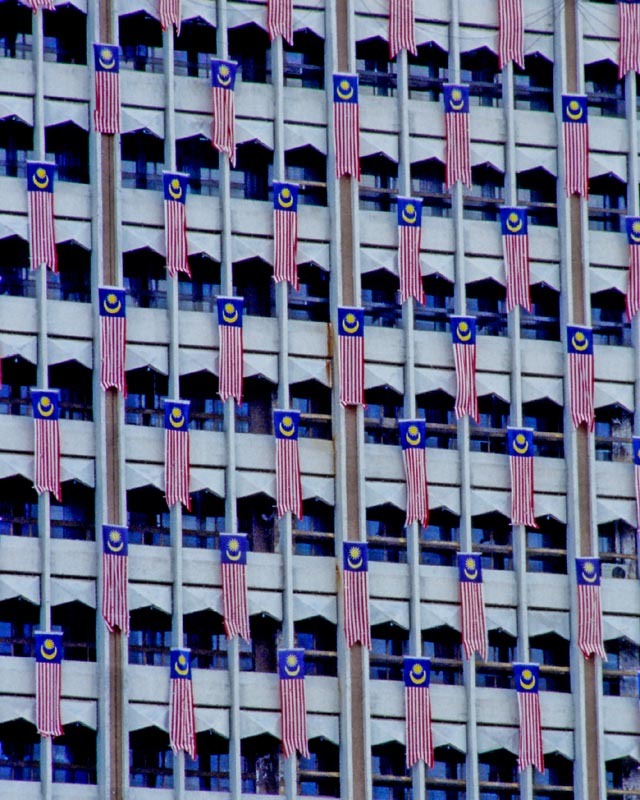 How do Malaysians celebrate their nation's birth? Silly question - they celebrate it the same way they celebrate just about everything else ... with food! Rotten fish isn't always a bad thing. Take bplaa raa (literally, 'rotten/moldy fish' in Thai). 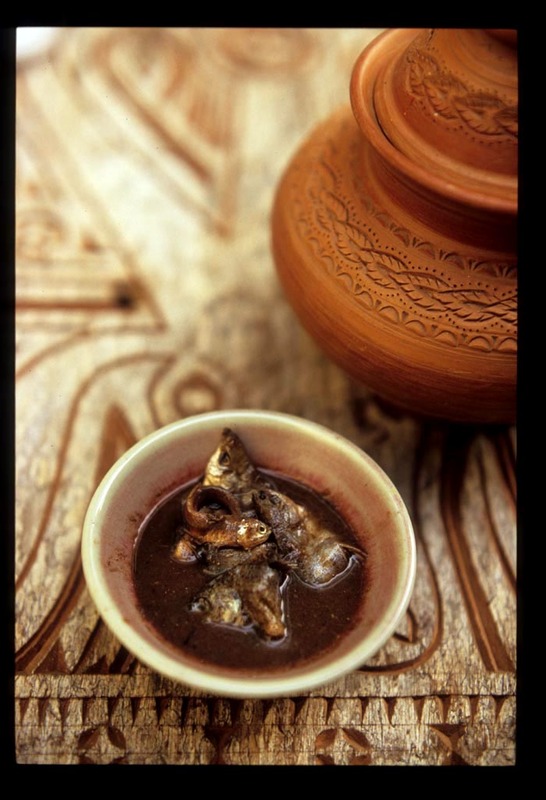 This fishy condiment with the unforgettable odor is a key ingredient in the cuisines of Thailand's northern and Isaan (middle northeastern) provinces. Though Thais classify it as a type of pickle (a 'dawng kem' - salty pickle; the other type of pickle is 'dawng priaow' - sour pickle), it's really more of a fermented product. 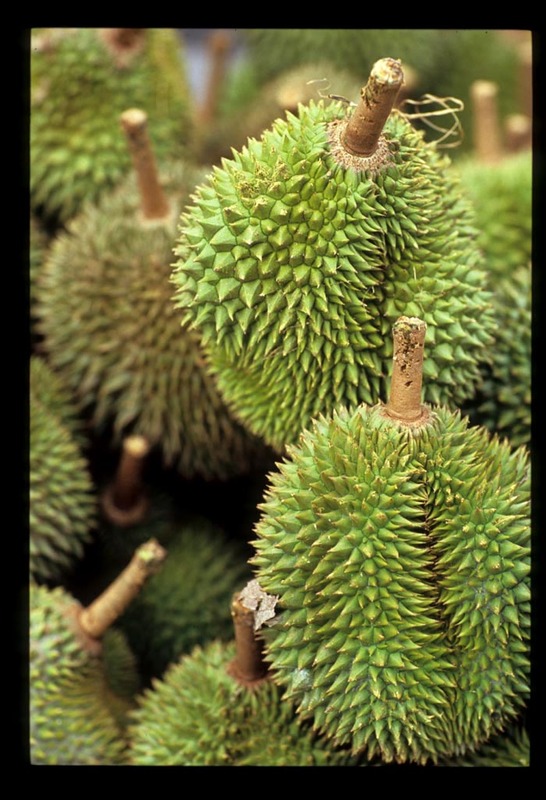 It finds its equivalent in Cambodian prahok and Lao padek. When it's 'done' bplaa raa is a mix of fish and thin brine that varies in color from grayish white to dark brown. If it's being made for commercial use it might be packed in jars - as is, or ground to a slurry. Bplaa raa is to nam bplaa (fish sauce) what a fine French blue cheese, shot through with veins of mold, is to cream cheese. It is salty fish essence with a bit of a tang, earthy and pungent. Once it gets on your hands, the odor is hard to remove. Leave a jar open in the kitchen and you'll soon smell it in the dining room. Bplaa raa stinks to high heaven. 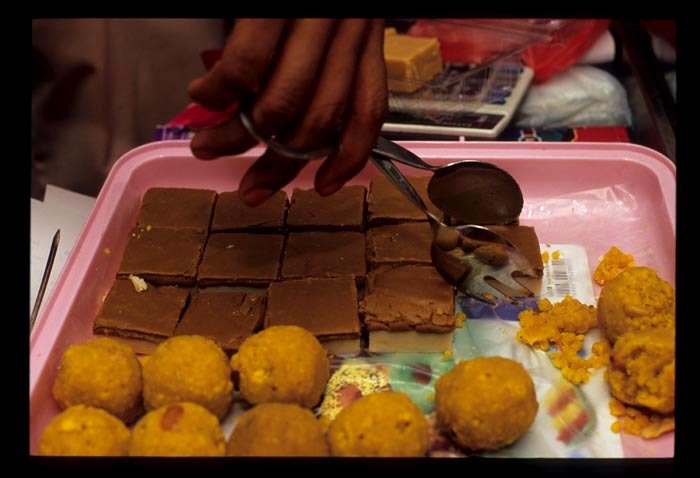 And the punch it gives to dishes is seriously, addictively, delicious. We watched her stir 'creamed' bplaa raa (upper right) into coconut milk-free gaeng (curries) and pound it, with chilies, into a nam prik (a sort of dip) to eat with raw and blanched vegetables. To make another kind of nam prik she pulled whole fish from a vat of 'chunky' bplaa raa, dropped them into a small pan of boiling water, and simmered the mixture until the fish broke up. (Bplaa raa fish pieces are never eaten uncooked, because of the risk of parasites. If they're not to be cooked in a curry or soup, they're boiled in water or steamed.) After straining the bones out of the liquid she returned it to the heat, added chilies, galangal, lemongrass, and garlic, and let it thicken to a thin batter-like consistency. Allowed to cool and seasoned with lime juice and fish sauce, this nam prik was dipped up with balls of sticky rice and more vegetables. If you're a Thai food fan and fond of fishy flavors - whether in the form of Asian shrimp paste or Western ingredients like bottarga and anchovies packed in salt - then bplaa raa will seem a natural progression from fish sauce. Start by substituting bplaa raa for fish sauce (or go half and half) in Thai salads and (coconut milk-free curries), and then move on to a bplaa raa-forward spicy/fishy nam prik, served with a good mix of raw and blanched vegetables. This nam prik is from Vatch's Thai Cookbook by Vatcharin Bhumichitr. It includes prawns or shrimp; they'll soften the intensity of the bplaa raa, so it's a good introduction to the world of bplaa raa-seasoned nam prik. If all you can lay your hands on is the 'creamed' product (usually labelled 'preserved mudfish' or 'preserved gray featherback fish'; be sure the product you buy is made in Thailand, Vietnamese mam is not a substitute) try dissolving 3 tablespoons in the amount of water called for in the recipe and proceeding from there. (KL residents can buy bags of chunky bplaa raa, both Isaan and northern Thailand produced, at the city's well-stocked Thai grocery; see below for details.) 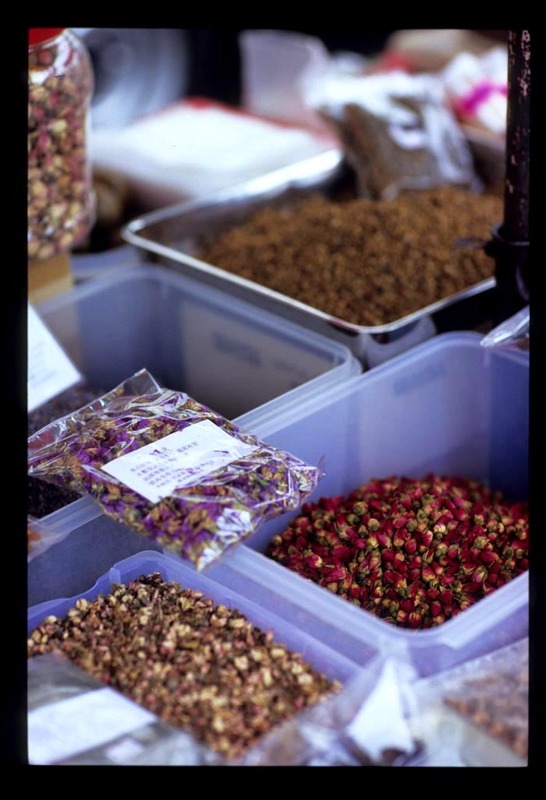 When making nam prik's it's best to taste and taste often, adjusting for salt, sour, and chile-hot along the way. 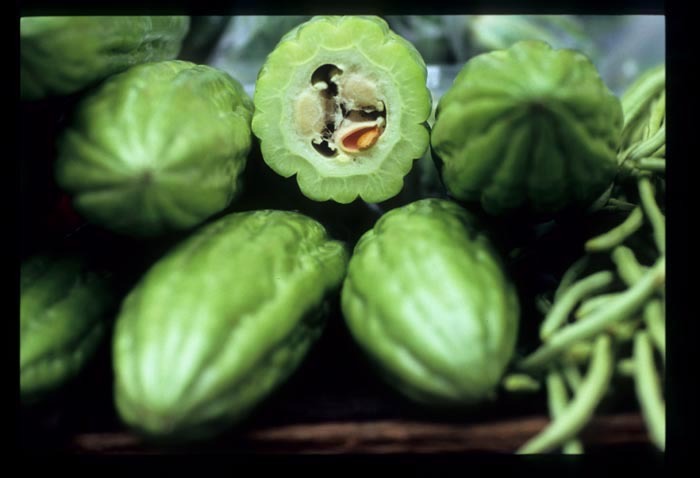 Serve with a mix of raw (cucumber, wing beans, cabbage, green or long beans, sugar snap peas, morning glory) and blanched (eggplant, green or long beans, cabbage, summer squash) vegetables. Heat the water in a small saucepan. Add the fish and simmer, breaking it up, until the liquid begins to thicken. Add all the remaining ingredients, stirring throughout. When the mixture has cooked to a runny paste, turn it into a small bowl. Serve with vegetables. Note: Bplaa raa and almost any other Thai ingredient you'd care to lay your hands on can be found in Kuala Lumpur at Font Thai Market, 5G Jalan Pandan Indah 4/8, Pandan Indah. Tel. 012-387-3963 (K.O. Tan) and 012-327-5718 (Font). I'm jumping on this bandwagon about a week late, prompted by an invitation (OK a 'tag', but we're not doing memes in the food blogosphere anymore - thank heavens - so I won't call it that) from this Bangkok-based photographer/food blogger. I'm a bit uncomfortable with the theme - 'Things to Eat Before You Die'. I mean, really, my standards of deliciousness are mine and mine alone; I'm certainly no arbiter of taste. So I'll call my list 'Five Things to Eat Before You Die - if You're in the Neighborhood'. I'd hate for anyone to fly halfway around the world, sample something on my list, and be disappointed. Cheeseboard pizza. When we lived in (and then, near) Berkeley, California, Thursdays were food-in-front-of-the-tube night. The rules for dinner were: no more than one or two plates/bowls per person, so it can fit on the coffee table in front of the TV, and kitchen 'active time' must not exceed thirty minutes. We rotated between mussels in white wine and butter, with thyme, whole spuds wrapped in bacon and baked in a covered casserole ('smoked' potatoes, as it were), and a 'half-bake' pie from the Cheeseboard. As much as I love, and miss, my Thursday night mussels, it's the pizza that makes this list. Fresh, simple toppings (my favorite, red cabbage with walnuts and gorgonzola is, unfortunately, defunct) and a not-thick but not-thin-and-crispy crust with just the right amount of chew. <sigh> I recently turned a San Francisco food blogger with a pretty refined palate onto Cheeseboard's pies (she'd lived across the Bay for years and had never tried one!). I was in love with Turkey within an hour of our plane touching down in Istanbul. Aglimpse of the domes of the Blue Mosque against a midnight sky from our taxi window did it. Breakfast the next morning - fresh bread and butter, sweet fragrant honey, thick yogurt, hard-boiled eggs, olives (three kinds!! ), vine-ripened tomatoes (in January! ), and multiple tulip-shaped glasses of tea, served by a jolly man with one of the biggest moustaches I've ever seen, cemented it. I fell so hard - for the people, the breathtaking vastness of the Anatolian plateau in winter, and (of course) the food - that I spent the next three years studying Turkish. We've had so many divine eats in that country, in Istanbul and in the hinterlands, on three coasts and in many towns, cities, and villages in between... but when it comes to food, for me Turkey will always first and foremost be manti ('mahn-tuh'). It's an unlikely combo - silky pasta knots stuffed with seasoned lamb and sauced with thick, warm yogurt - but it really, really works. The kicker is what adorns the finished dish: a generous scattering of dried mint and a hefty drizzle of butter seasoned with crushed red pepper (earthy, ballsy Urfa pepper - from the southeastern city of Sanliurfa - preferably). 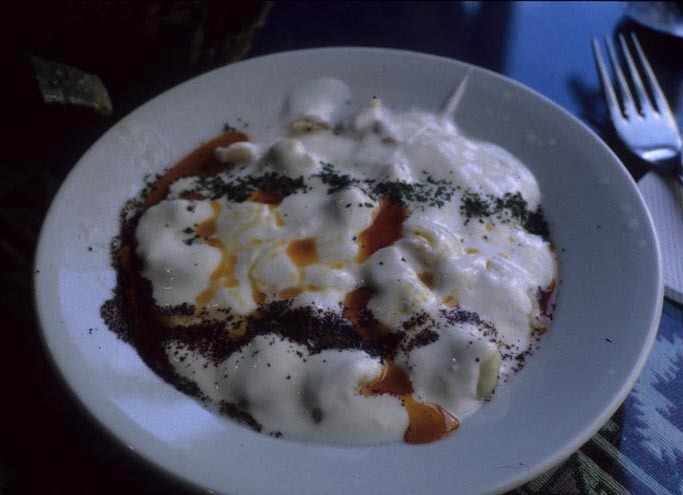 The Anatolian city of Kayseri is Turkey's 'manti central', but look hard enough and you'll find it just about everywhere (this dish was 'mmmm'd over in a mom-and-daughter lean-to in Antalya's Kaleici district). Smaller - a smidge of lamb bound in a pasta parcel the size of the tip of your little finger - is better, but I'm not too picky. This Istanbul blogger recommends a spot in her town where, she says, the manti is just like (her) mom's. Sweet corn in season, Anywhere USA. It doesn't happen too often, but right about now I'm wishing I was back in California, or in just about any corn-producing part of the States. It's sweet corn season, that time of the year when I can put away four cobs in a sitting, no problem. Corn that's grown just for eating is light years away from the fairly-decent cob product we can buy here in Kuala Lumpur - pig fodder, it's certainly not! American sweet corn kernels are smaller, more tightly packed, and plumper (the cob won't get bought if they're dented) and packed full of sugary, corny goodness. Boiled and then dabbed with butter and salt is good, but shucked, buttered, salt-and-peppered, wrapped tightly in tin foil, and placed on the grill until the juices start to seep, mix with the now-melted butter, caramelize, and, in a few spots, scorch just a bit - is the best. Since moving to Malaysia I've come to appreciate the value of lard - as a sauce component. 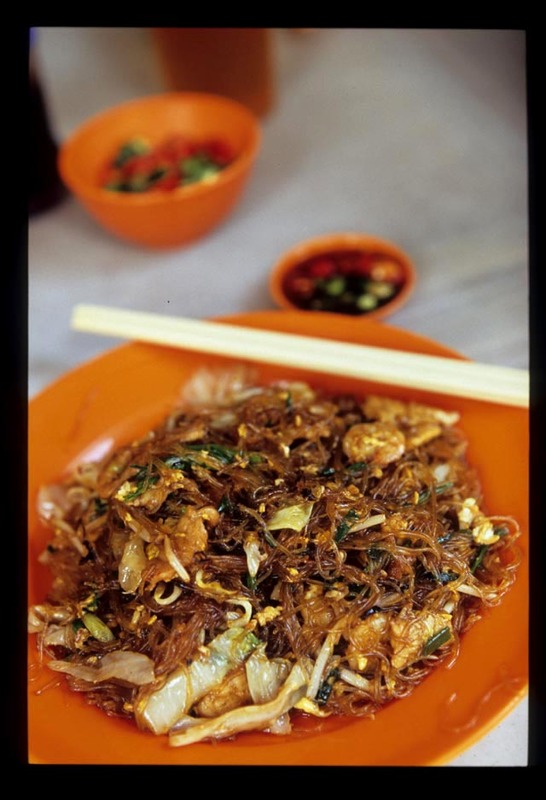 Lard elevates a plate of wonton mee or a bowl of Hakka noodles to something the angels might sing about. I've nattered on about my love of lard here and here, so I won't belabor the point. 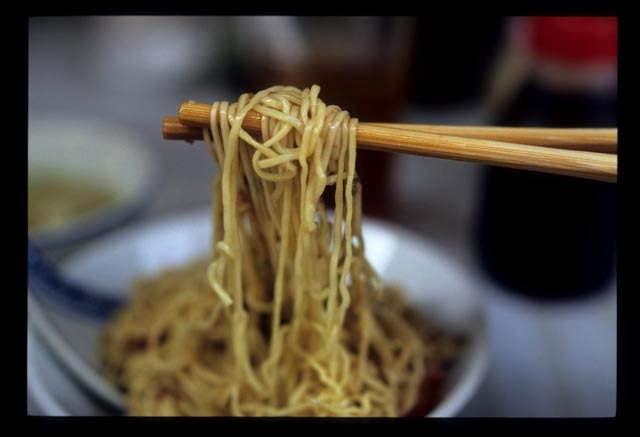 Suffice it to say, if you visit Malaysia and leave without partaking of at least one serving of larded noodles, you're crazy (assuming religion and/or diet allows, of course). Liver pate at Sean's Panorama, Bondi Beach, Sydney. I'm not a liver fetishist - I don't seek out foie gras and I don't dream of liver and onions. I don't even eat that much meat. But I do think about this dish at least once a week. 'Nuff said. For more food blogger 'Must Eat" lists, head over to Traveler's Lunchbox and have a gander at at Melissa's master list at the end of her post. Raub, a speck of a town 110 kilometers from Kuala Lumpur, straddles the two-lane highway to Fraser's Hill and beyond; you'll pass right through it if you're off for a few days of jungle hiking in Taman Negara or driving to Kota Baru but eschewing the coastal route. A major player in Malaysia's faded days of gold mining glory, sleepy Raub isn't much of an overnight destination. 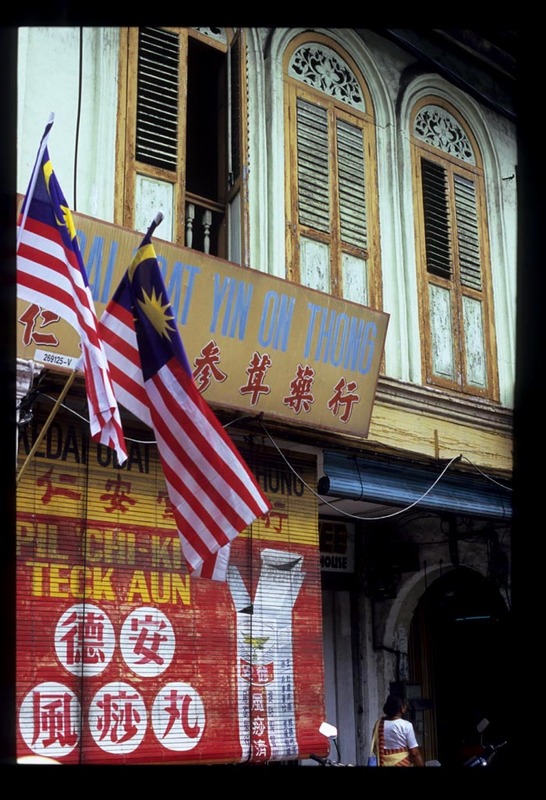 But, tucked amongst its faded shophouses and around its outskirts are enough gastronomic attractions to justify a stop en route to, and/or on the way back from, somewhere else. We rolled into Raub at the tail end of lunchtime, tired, hungry, and irritable after an hour of sitting in crawling traffic (note to self: do not attempt to enter or pass through Bentong in the leadup to Friday prayers). 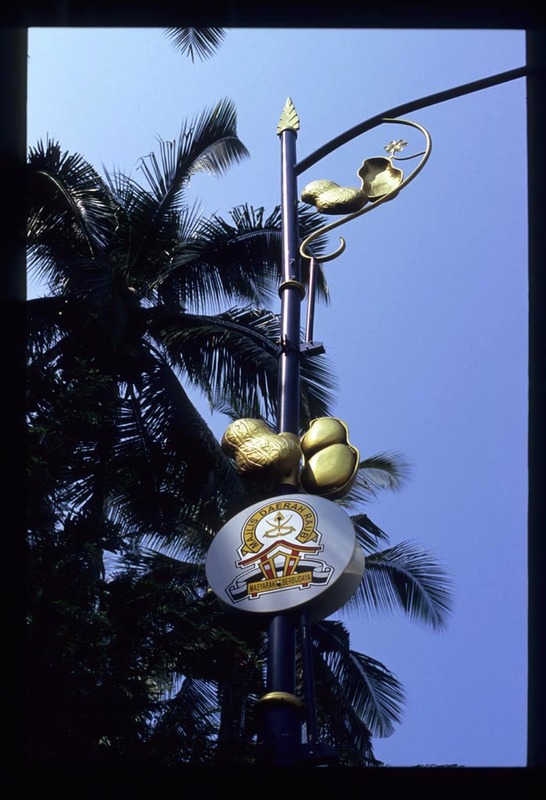 Restoran Ratha's can't-miss sign ('Famous Kari Ayam and Kari Kepala') pointed the way to lunch. Ratha was packing in half the town, it seemed. 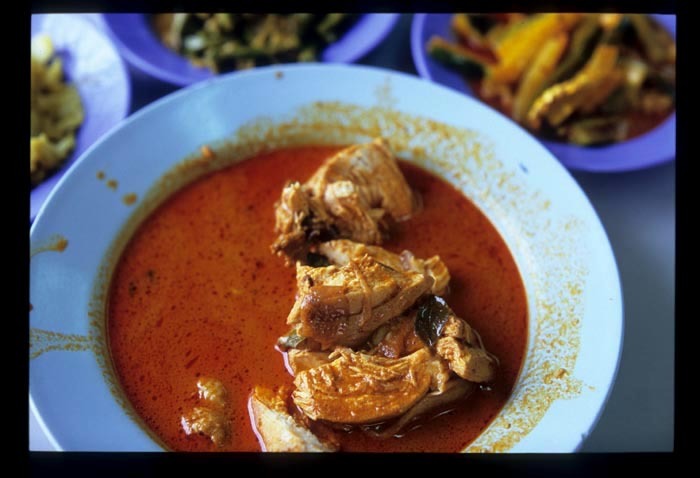 And almost every customer was supping on kari ayam (chicken curry). Ratha's curry surprised in a couple of ways. 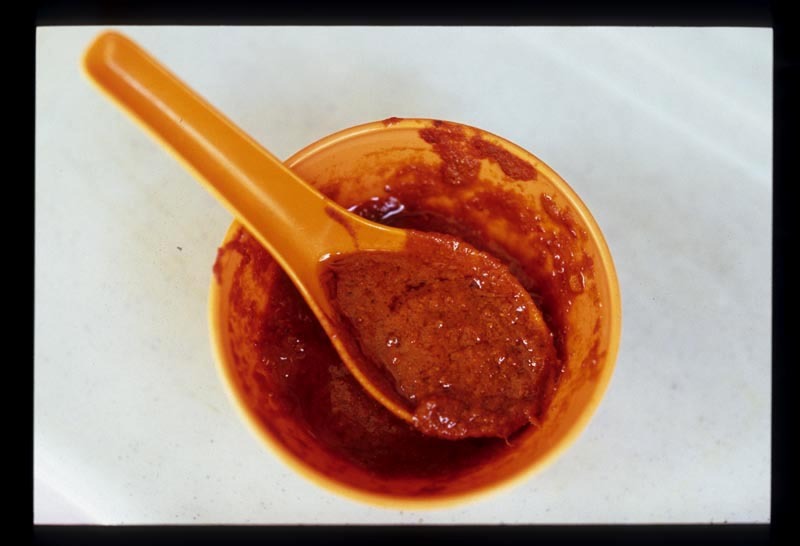 It's spicy enough to leave the lips tingling, a quality we've found to be rare in Malaysian food (it takes a lot of chile to get my attention). 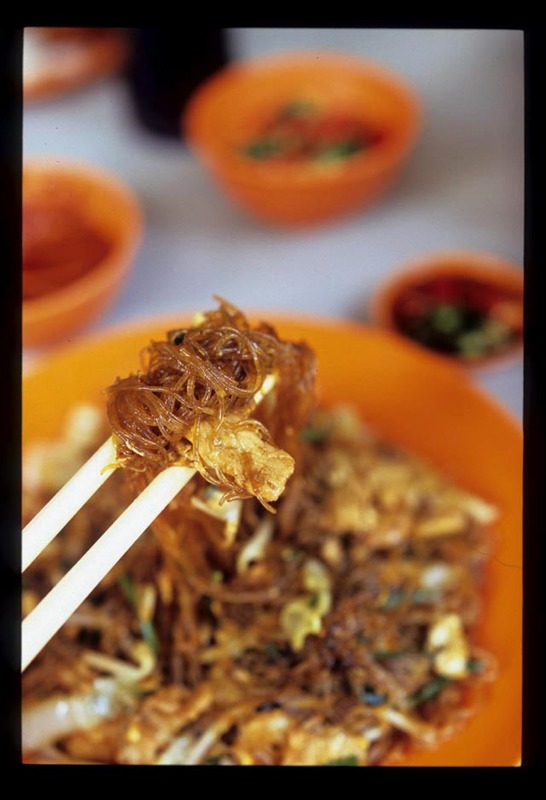 And it's thin - watery, even - but packs as much of a flavor whallop as a thick rendang. In spite of its heavy heat, this curry's dominant flavor is rich, fresh coconut milk, leavened with fresh curry leaves and tamarind tartness. Our bone-in breast pieces were tender and moist. A few bites and our frazzled nerves were soothed. 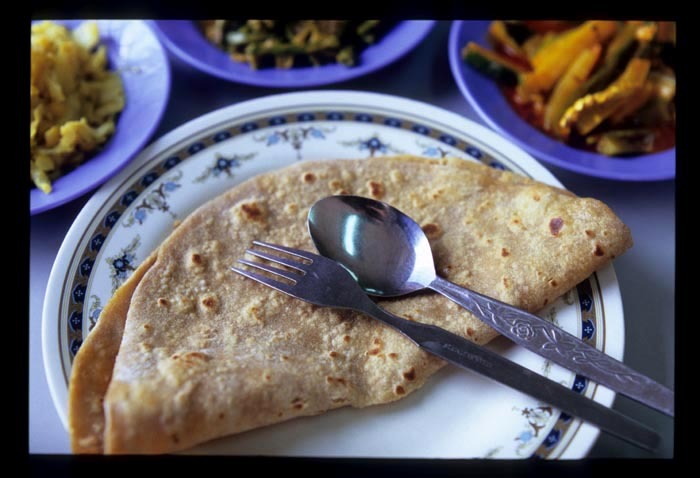 Chapati (and, in the morning, puri) are made to order. In retrospect rice might have been the wiser choice, to soak up the soupy curry (we delivered it direct to mouth, via spoon, instead), but we enjoyed these warm, soft, wheaty rounds nonetheless. Vegetables, so often an afterthought at curry houses, get tender loving care at Ratha. 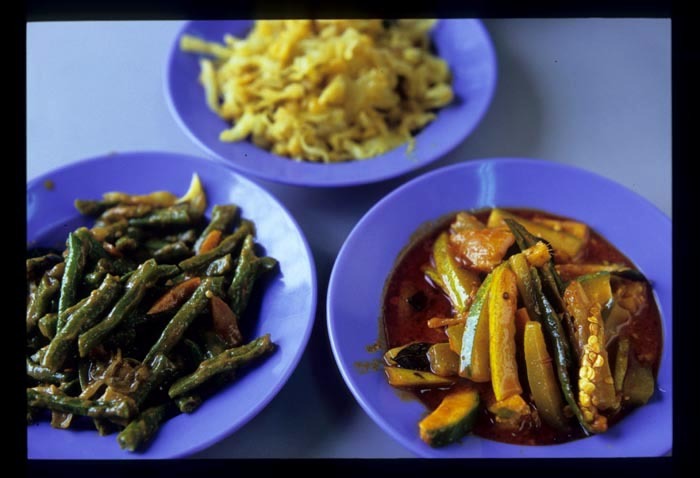 Acar (pickle - lower right) is a sour and not-too-sweet, melange of cucumber, pineapple, and piquant green chiles, seasoned with whole curry leaves. Cardamom and cumin-scented thick coconut milk makes a delicious dressing for crisp-tender long beans and carrots (front left), and urad dal and turmeric make tasty, classic southern Indian seasonings for thickly shredded cabbage. Ratha has earned its fame. Next time we'll try the ikan kepala (fish head). You'll never get lost in 'downtown' (I use the term loosely) Raub. There's two main streets, each about two blocks long. They're parallel, and both are one-way; traffic entering the town from the south is funneled onto one, cars heading in the opposite direction use the other. After lunch we walked, against traffic, the downtown's permiter (it took about three minutes), in search of dessert. We found it at an old-fashioned teahouse called ... Tea House. 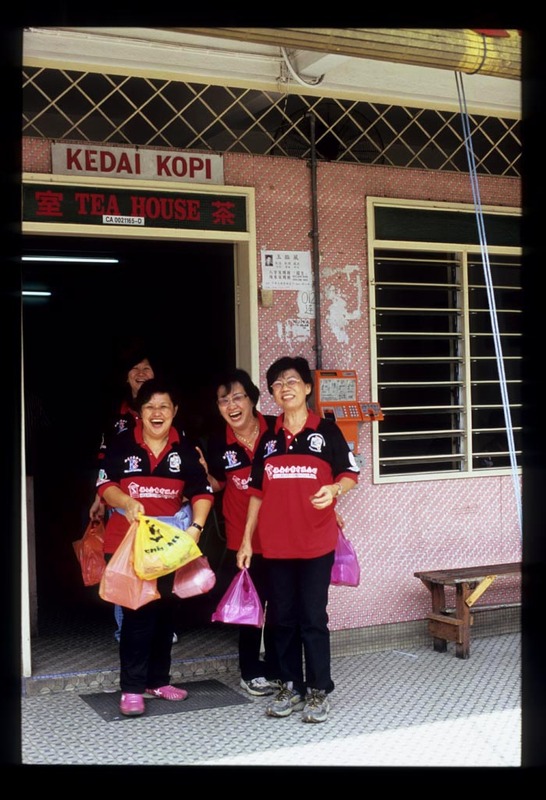 These ladies are smiling because they're carting off a load of Tea House's specialty, curry and kaya puffs. 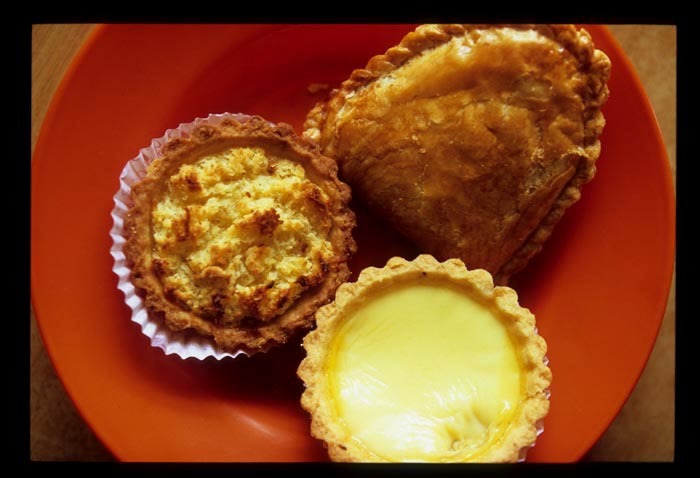 We sampled the latter, along with a coconut and an egg tart. It being three or so in the afternoon, none were warm (get there around eleven or twelvish for just-pulled-from-the-oven freshness) - but all were darned delicious. 'Almond Joy without the chocolate' (and the sugar overload) is how I'd describe the mini coco pie, all crusty and crispy from the oven. Our egg tart showed an admirable amount of jiggle, like a comforting custard, and tasted rich and eggy - no vanilla, not much sweet. 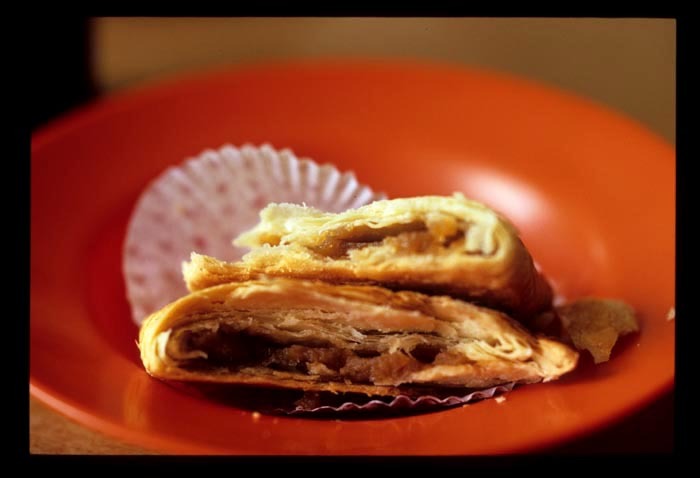 As for Tea House's kaya puff, feast your eyes. Layer upon layer of light, flaky pastry, golden and crispy on the outside and pale and tender in. Inside, not too much - but enough - smooth kaya, slowly cooked to an almost butterscotchy mellowness. If we'd been on the way home, instead of headed to points north, I'd of walked out of Tea House with bagfuls of these. Returning home through Raub the next day, we took advantage of the town's other bounty: peanuts. Raub displays much pride in its status as a nut epicenter. 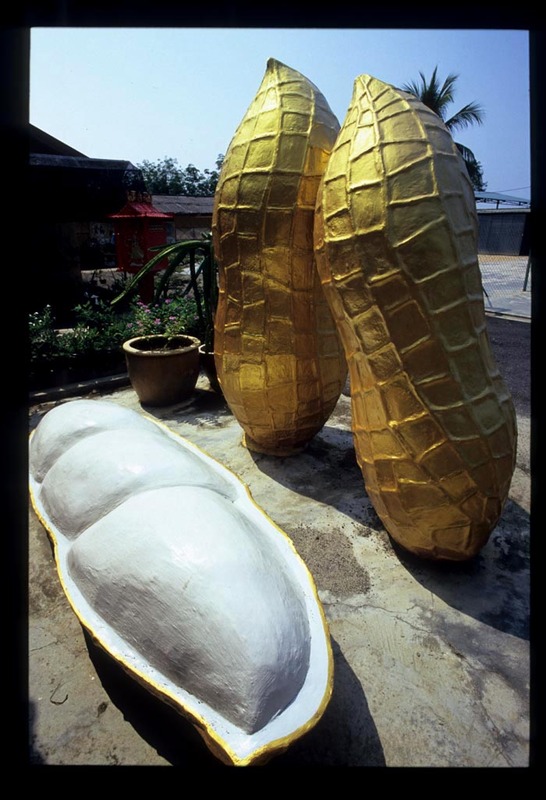 Tell a Malaysian you're headed to Raub, and the topic undoubtedly arises - the place is known for kacang goreng Sempalit (peanuts in the shell from the village of Sempalit, fried). They're sold, in their bright red packages, outside of Raub, of course. But it'd be silly not to take advantage of proximity to stock up. We did so a kilometer or two north of town, at a roadside shop. I don't remember the name but, believe me, you can't miss it. On offer here, fresh fruit (delectable guava, unremarkable pomelo) and two long tables laden with peanuts and assorted peanut products such as kacang bebang (peanut brittle), biskut kacang bijam (round, crispy-airy cookies topped with a gooey layer of sweetened white sesame seeds and whole peanuts), and intensely flavored, bite-sized ground peanut biscuits. 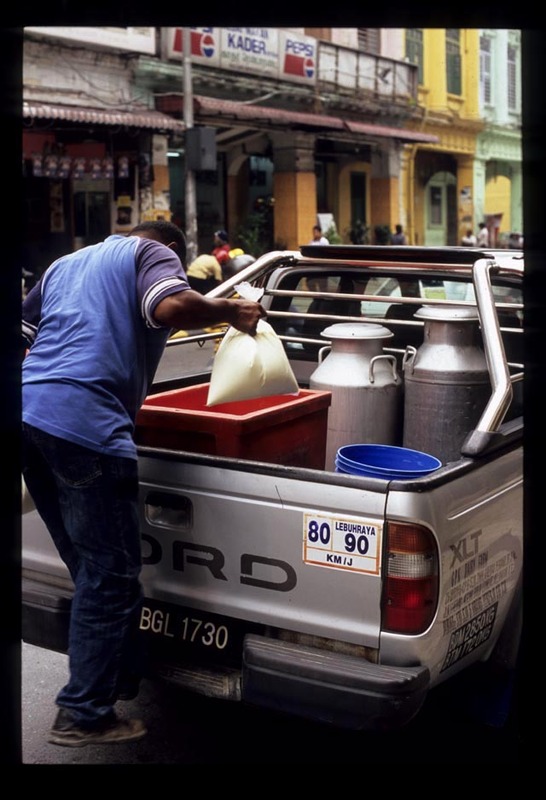 About a half an hour south of Raub lies Bentong, and Kow Pow Ice Cream, where we stopped for a package of frozen peanut dairy goodness to go. Back home that night, dessert was peanut ice cream topped with Raub peanut brittle - a match made in heaven. Restoran Ratha, 82 Jalan Tun Razak, Raub. Tel. 09-356-1651. 630am-930pm. Tea House, 28 Jalan Dato' Abdullah, Raub. Tel. 09-355-1182. 8am-630pm. 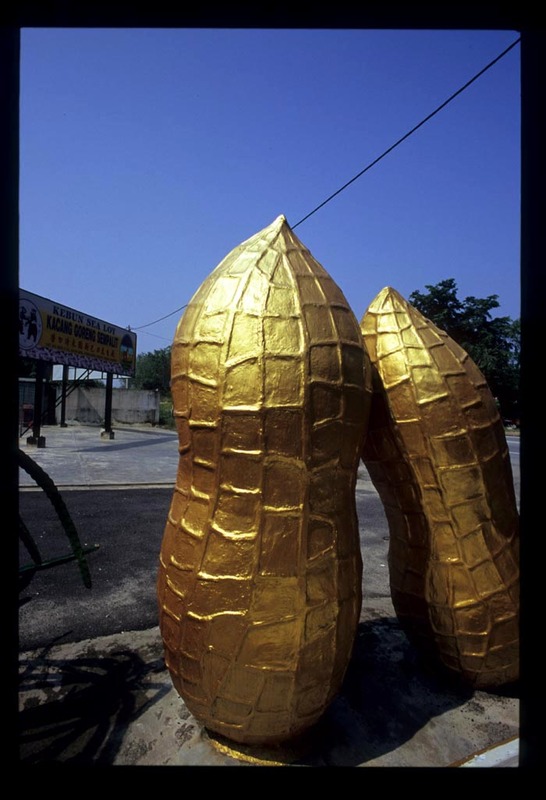 Roadside peanut stop - about one kilometer north of Raub, on your left if you're heading into town (look for the big gold nuts). But the rest of Luang Prabang's Phousi Market sounds right up our alley. After a trip, when I'm mentally cataloguing sights and sounds and flavors and smells, it's often the most unremarkable things that stand out. Like this bowl of bubur sumsum, a masterpiece of minimalism consisting of just two ingredients (three, if you count water): rice and palm sugar. 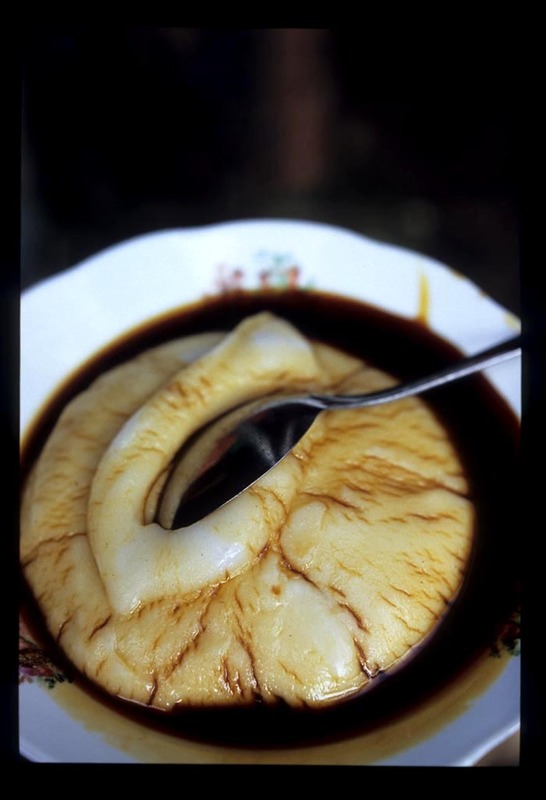 We stumbled across bubur sumsum on Sumatra, at Bukittingi's fascinating wet market, when we spied a banana vendor spooning up what looked, from a distance, like vanilla pudding with chocolate sauce. I mimed, asking her where she bought it. She motioned to a tented stall behind her. I walked over and cautiously parted the white cotton panels, peering inside. Women, only women, sat shoulder-to-shoulder on narrow wooden benches lining three of the tent's walls. 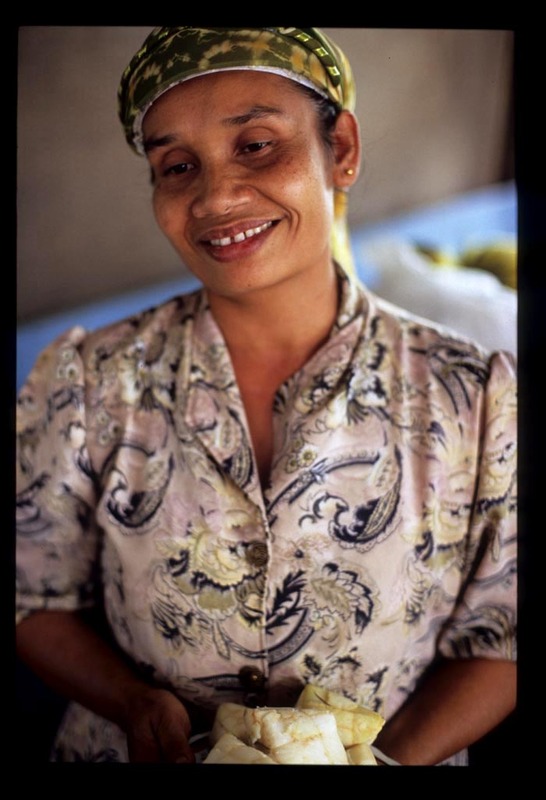 Between laughter and chit-chat, in this female version of a pondok kopi, heads dipped to sup from bowls of 'pudding' or ketupat (pressed rice cakes) doused with thin yellow curry. I went inside alone. It didn't seem proper for Dave to follow, even though a few of the older ladies inside indicated otherwise. 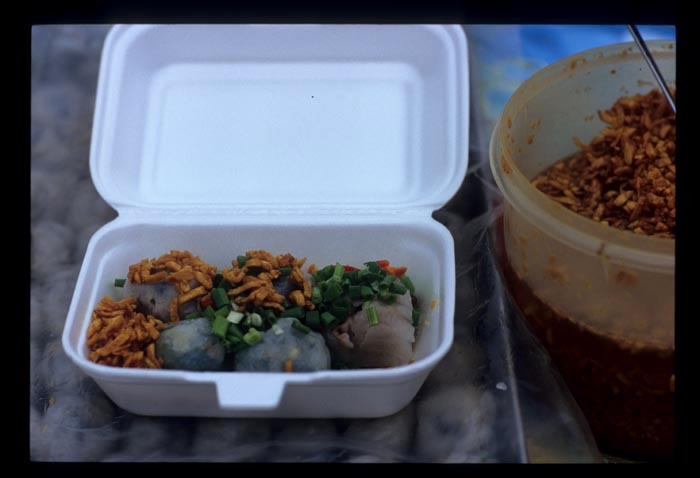 When the vendor passed me my bowl of bubur sumsum I handed it out through an opening in the wall to Dave, so he could taste and photograph it. Bubur sumsum is rice cooked and ground fine, to a smooth paste as thick as cream of wheat, and doused with melted palm sugar. It's that simple. But not so simple, because the rice is fresh and fragrant and chosen with care. 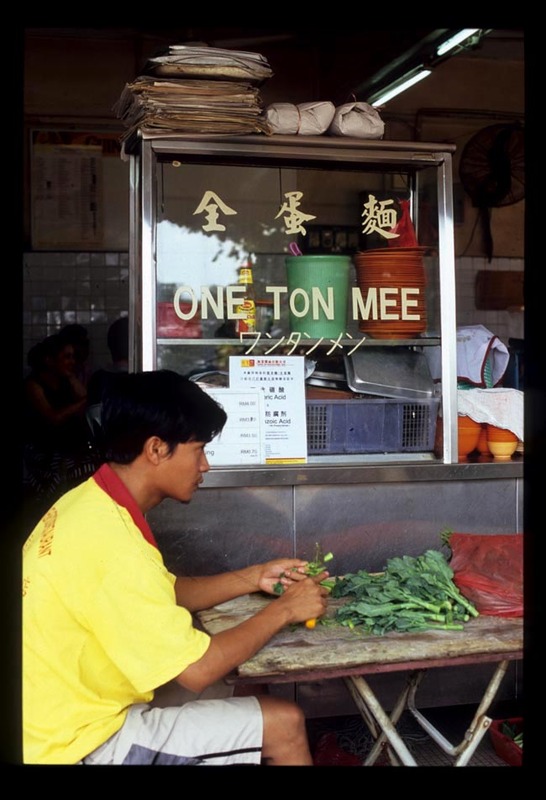 It may even have been grown by the family of this lady who serves the bubur. And palm sugar isn't just any sugar. 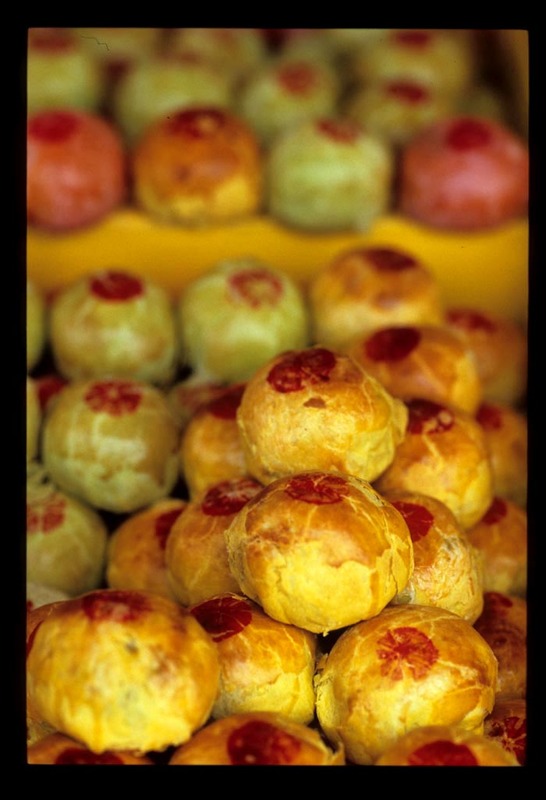 Indonesians call it gula merah ('gula' means sugar, 'merah' means red). 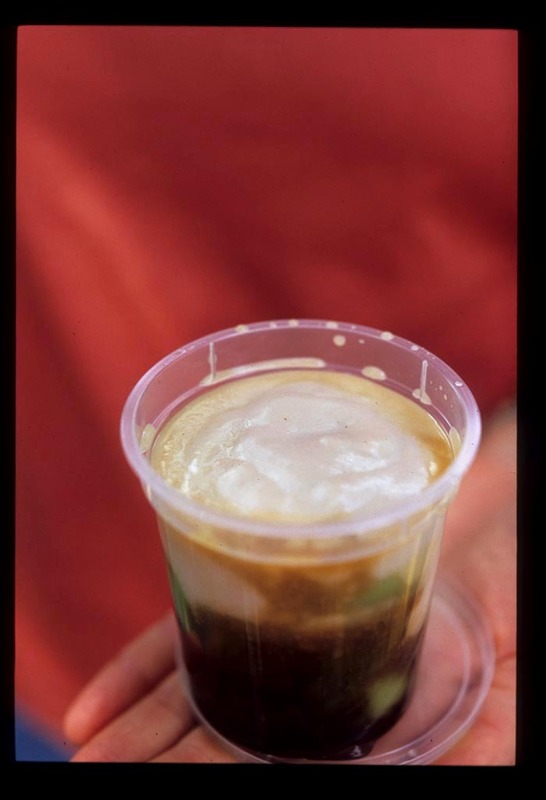 Sumatran palm sugar isn't red, but a deep, almost-black brown, the color of dark-roased coffee beans. 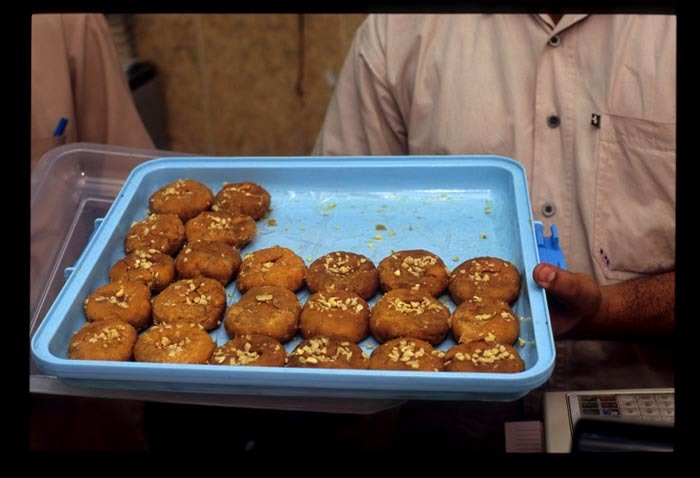 Sold in cakes, or half-spheres, or logs, it varies in consistency from crumbly to caramel-like sticky. Sweet and a little sour, bitter like unsweetened chocolate and coffee, and smoky from the fire it's reduced over, Sumatran gula merah is as complexly flavored as a hand-crafted truffle made from the finest chocolate in the world. It's a basic flavoring agent in everything from Indonesian kuih and candies to curries and crackers. 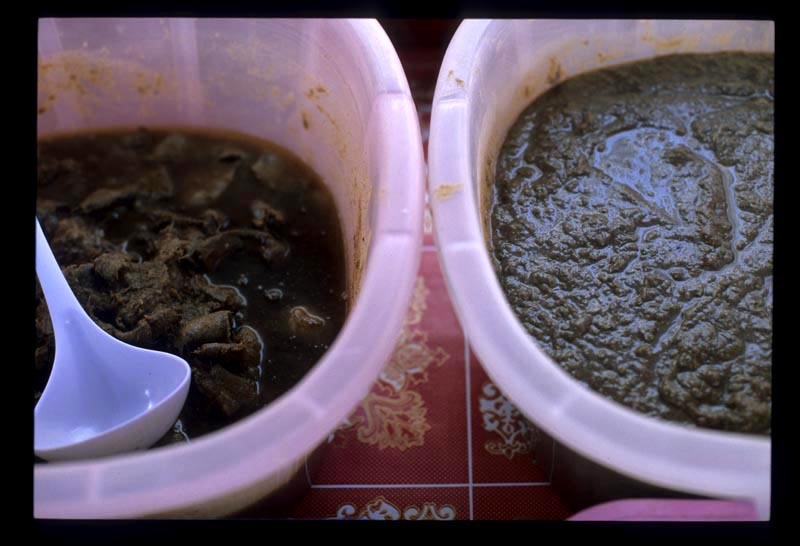 In Malaysia, bubur sumsum is a less miminalist treat. 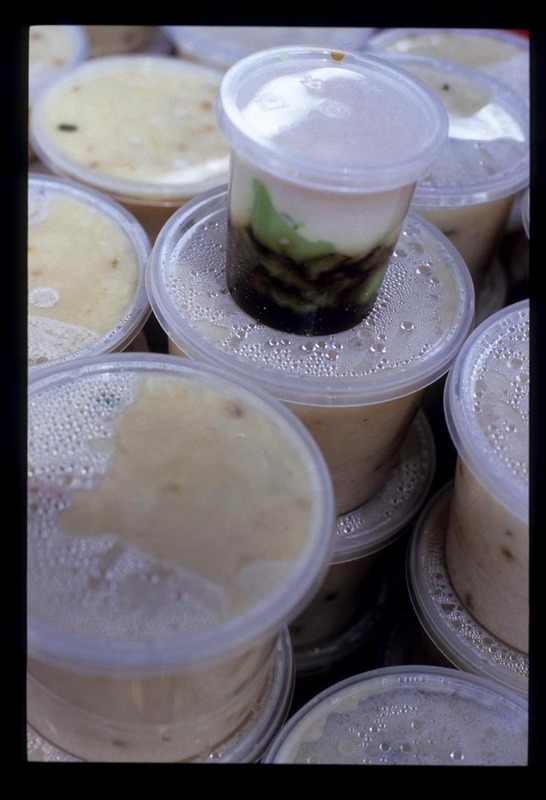 On Jalan Raja Alang, in Kuala Lumpur's mostly Malay Kampung Baru district, we found a few plastic cups of bubur sumsum atop a vendor's display of savory bubur. 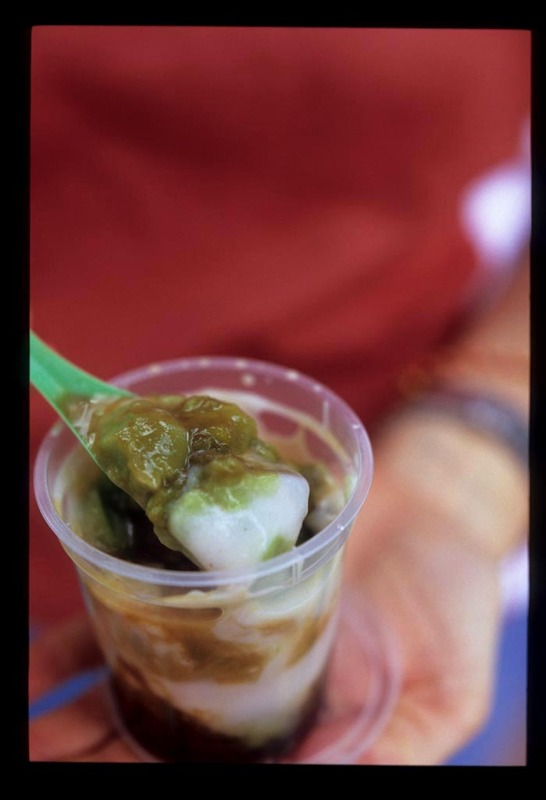 This vendor uses beras pulut - rice flour - to make his bubur, and he adds not just melted gula but pandan-scented coconut milk pudding as well. It's delicious enough, this soupier, less hearty bubur sumsum with its coconuty milkiness, but it's a bit sweet, and the richness of the pudding detracts from the layered flavors of the gula. After a bite or two I've had enough. At the Bukittingi 'pondok bubur' I finished every last drop, and had to restrain myself from licking the bowl clean. When it comes to the sumsums, less really is more. 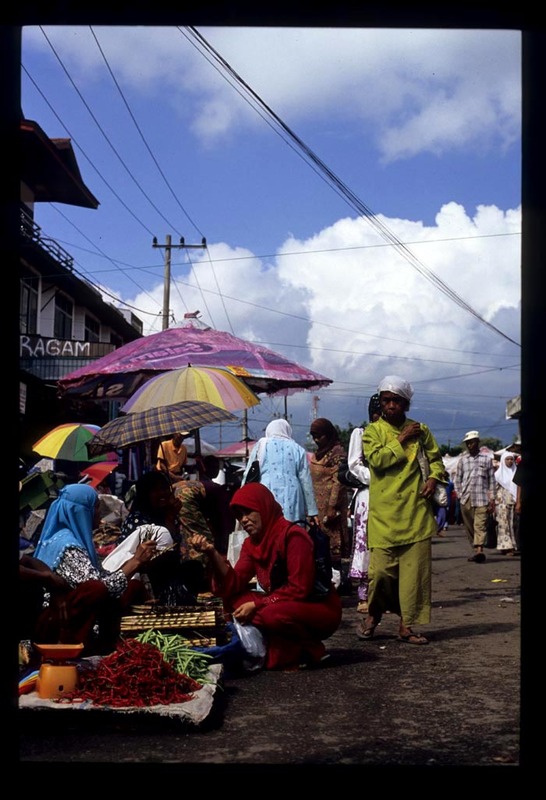 Bubur sumsum, mornings in the lowest section of the Wednesday and Saturday extended markets, Bukittingi, Sumatra. In Kuala Lumpur, sold from a number of stalls along Jalan Raja Alang, opposite side of the street from Masjid Jamek Kampung Baru (mosque), from about 10am. Every market's got it's vibe. 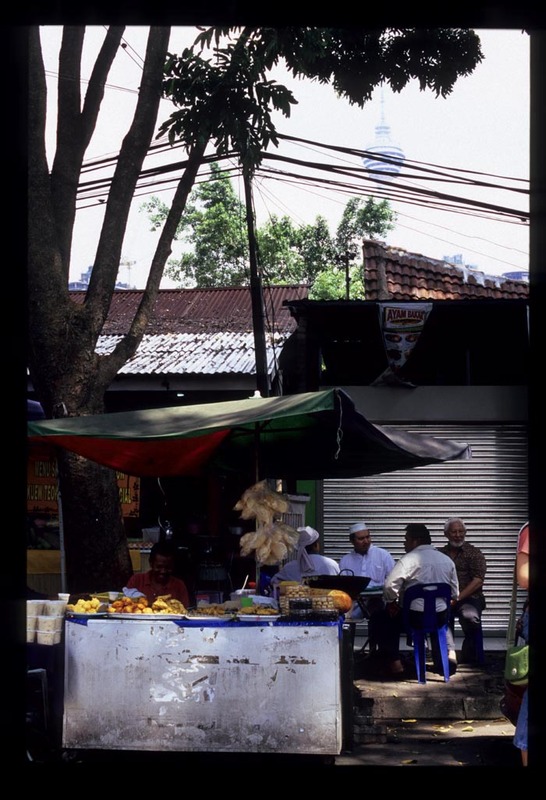 Bangsar's daily morning market is all business, but friendly. Temerloh's pekan sehari is laid back, as any market that takes place only on Sunday mornings should be. The Pudu market off of Jalan Pasar is high-energy, noisy and lively. Petaling Jaya's SS2 pasar malam is ... cranky. the fruit beyond reproach. Sidling up to one of SS2's many seafood stalls one smells nothing but air and a hint of salt; fish, prawns, squid, crab all look as as if they've just been pulled from the water. 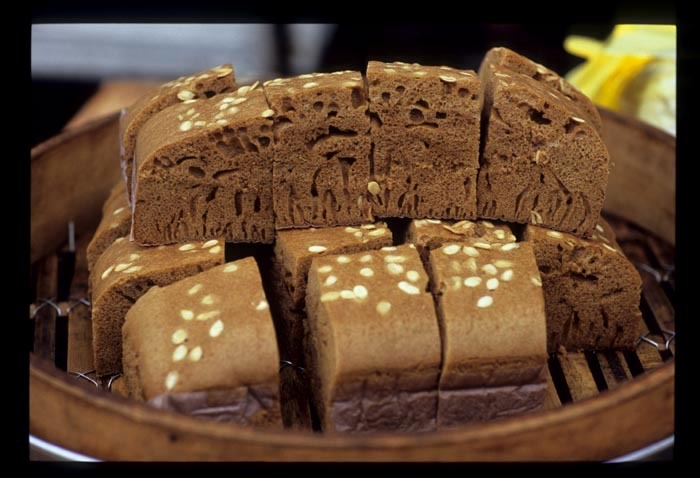 and exceedingly fragrant almond-topped steamed spice bread tempt sweet tooths. and seemingly every plant under the sun, from flowers (roses, lavendar) to vegetables (bitter melon), dried and ready to be made into tea. But what's up with the vendors? I've rarely encountered such a bunch of - to use one of my dear mother's favorite phrases - sour pusses in my life! Never a smile, rarely a grunt. With the exception of the ladies we bought a pile of fish from, a sweet grandmotherly type selling super sweet corn on the cob from a single rattan basket, and an outgoing guy offering big bags of oyster mushrooms for just three ringgit, we didn't find much fellow feeling at SS2. 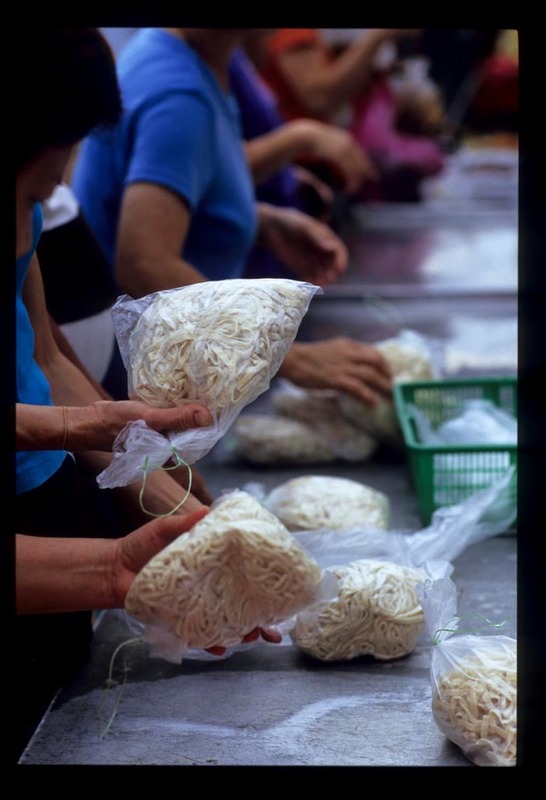 Spying a crowd around a vendor's table, we squeezed in to find customers snatching up bags of fresh noodles the minute they were unloaded. Being confirmed dough heads, we wanted in on the action. 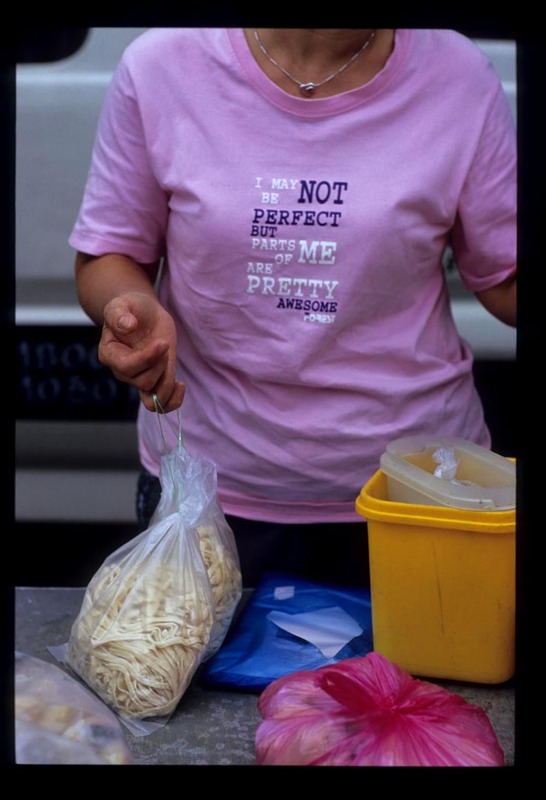 Hmmm ... did she seriously believe that this orang putih (white person) didn't know what a noodle was? 'No, I'll give you something eeeaaaasy-er to make,' she barked, reaching back into her van. Then she dumped the contents of another bag onto the table: thin, obviously not freshly made noodles frozen together in big clumps. They lay there, unloved and untouched by any of the other customers, some of whom were now behind the table, rummaging about in the van for more fresh noodles. 'Ugh, no thanks.' We moved on. I'd love show you the sweet-smelling fresh bean curd being sold from a wooden barrel, but the vendor, shouting, chased Dave and his camera away. Now, I'm sympathetic to any vendor reluctant to share his trade secrets, but I'm still trying to figure out what might be revealed in a photo of bean curd in a wooden barrel, other than that it's .... in a wooden barrel. In fact, our photos from SS2 are relatively few, given its size and interest. 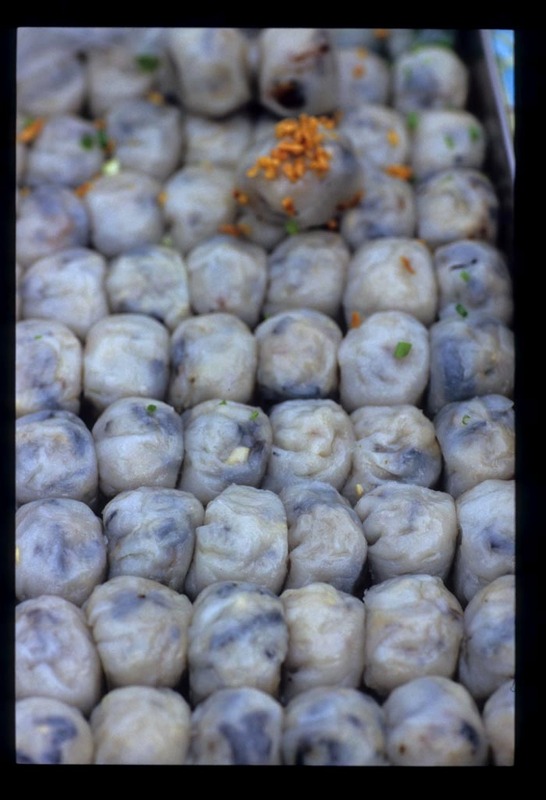 A mother-daughter team didn't seem to mind our documenting their specialty: rice flour dumplings filled with a choice of yam, turnip, or Chinese chives. These obviously homemade treats are really something special. The wrapper is thin, just thick enough to contain the contents, and the lot is topped, if one wishes, with plenty of chopped scallions and big, crispy-chewy chunks of golden fried garlic. The flavorful and spicy chile sauce that accompanies is just that: fresh red chiles, ground with salt. 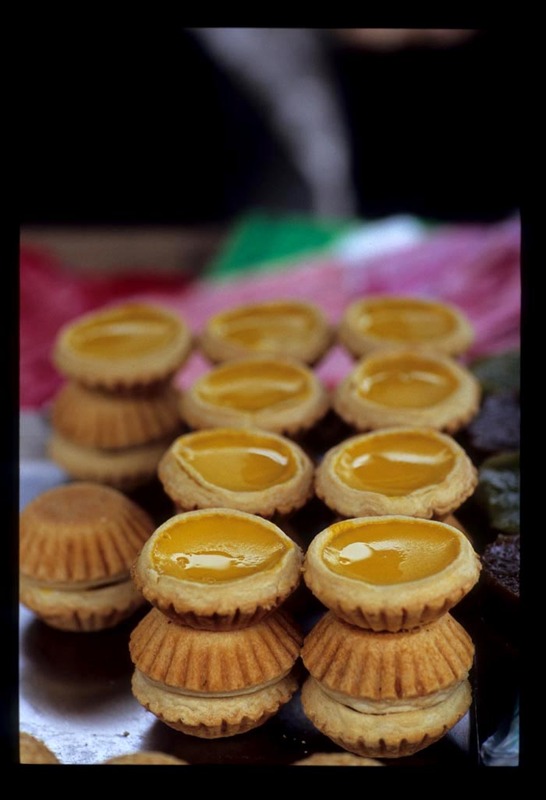 If I were to revisit SS2's pasar malam (doubtful), it would be for another box of these tasty mouthfuls. 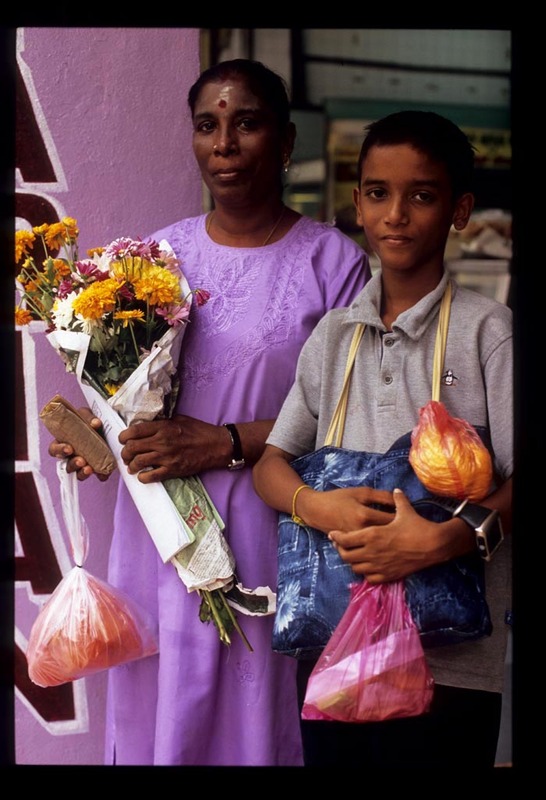 SS2 pasar malam, Thursdays from about 5pm. and, if need be, borrow money. 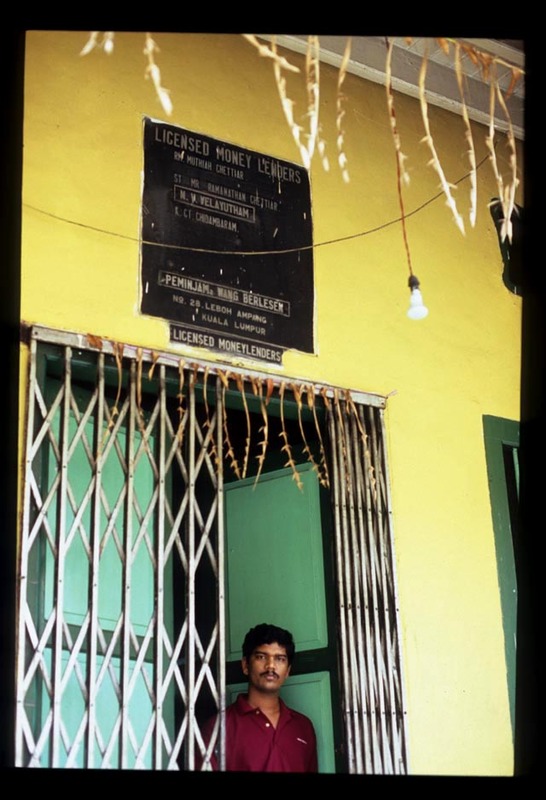 Many of the buses that ply this route would be at home on the streets of Chennai or Mumbai. Lebuh Ampang is especially lively on weekends. 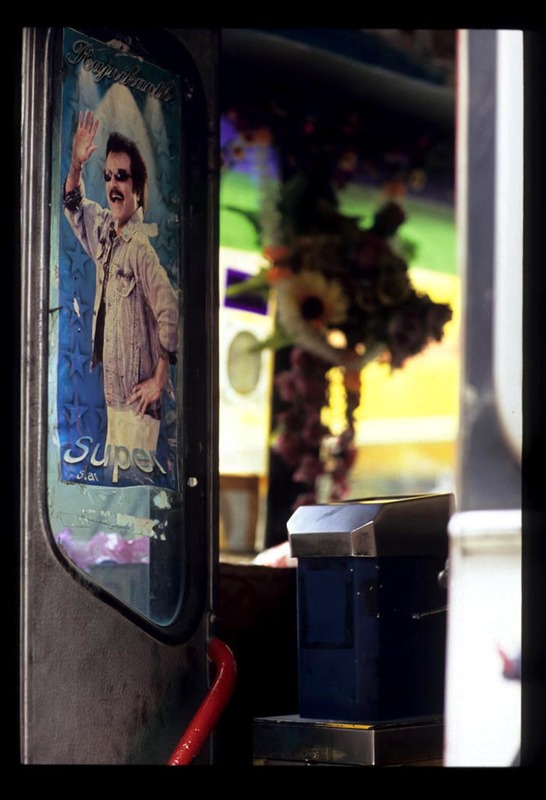 Crowds are thicker and the sidewalks, throbbing with Bollywood hits pumped at ear-splitting volume from the stereos and TVs of competing DVD and CD dealers, are host to a variety of itinerant vendors selling everything from jewelry to told fortunes to homemade vadai. Never being ones to stop at a single meal, we wandered this way in search of sweet treats after our lunch at Hong Ngek. 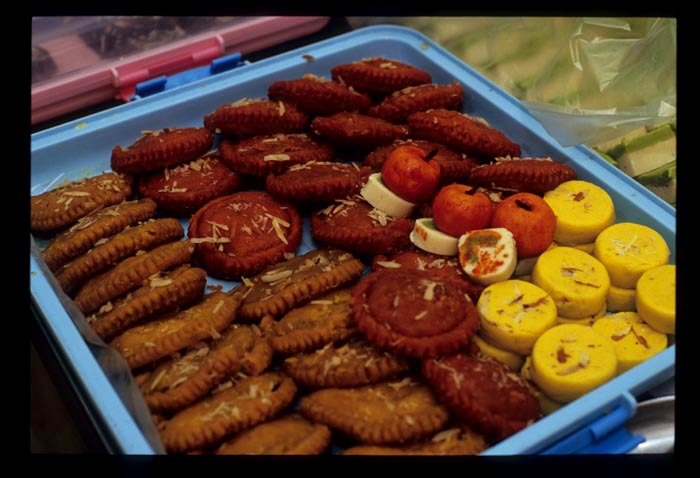 The Indian sweets piled high in the window of Bakti Woodlands beckoned, and the friendly wave of a waiter drew us in. and shaved almond-topped, layered pastries of red and gold soaked in honey. There's no doubt that we went overboard, ending up with more sweets than we could possibly eat in two days. After we'd paid for our purchases the proprietor placed two small bowls on a table at the front of the restaurant and motioned for us to sit down. We slurped up dainty spoonfuls of semiya payasam, a dessert based on the fresh milk that's delivered to the Woodlands's door daily. Payasam, a warm 'liquid pudding' of thickened, boiled milk, varies according to the region of India in which its made. This heavenly version was packed with slippery vermicelli, cashews, almonds, golden raisins, and plenty of cardamom. We'd never tasted anything like it, and decided then and there to return the next day to mine the Woodlands' menu. 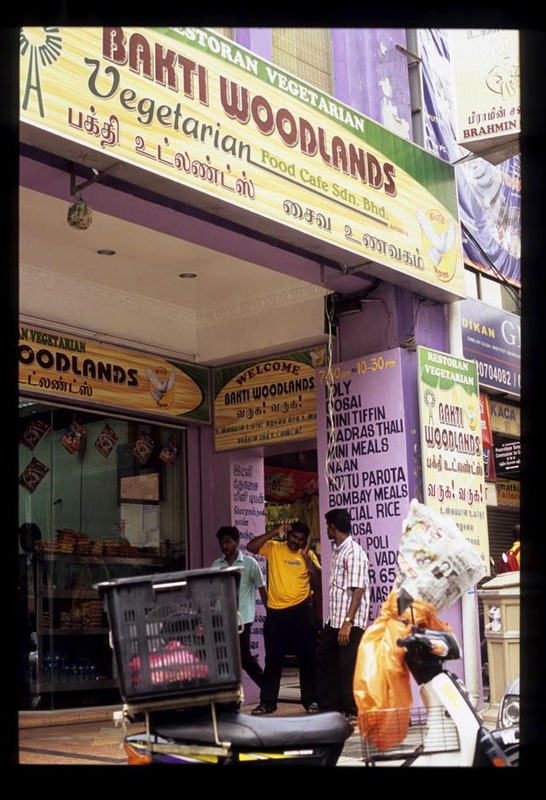 There's lots of unusual dishes on offer here - some, such as idli, are served only until 11am, and many of the restaurant's more substantial dishes, such as their daily specials (eg. keerai adai - pancakes of rice and fenugreek leaves) are only available after 5pm. 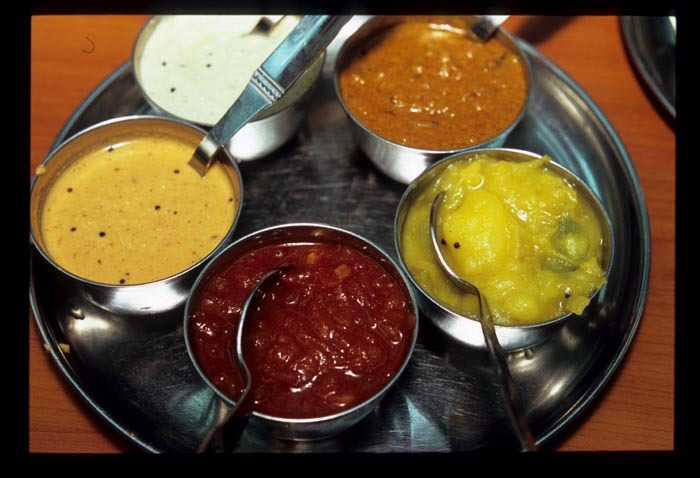 The friendly staff at this year-old establishment is happy to help southern Indian vegetarian food novices, like us, wade through the choices. 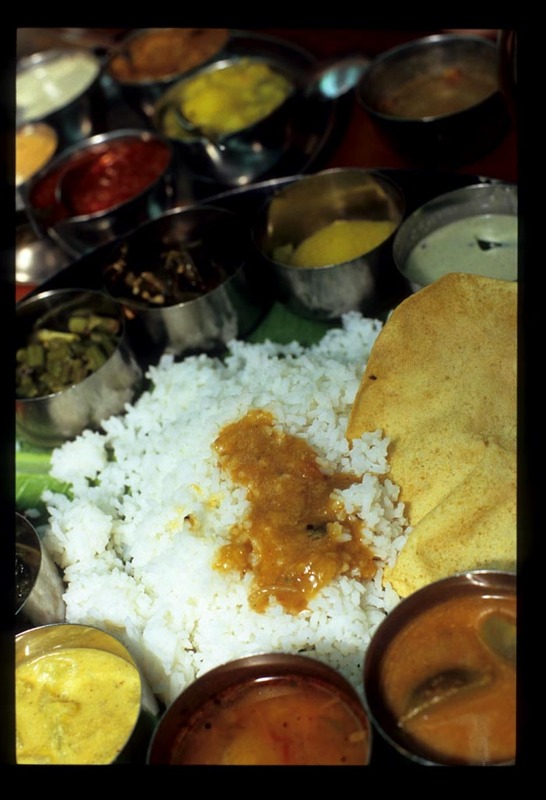 The Madras thali, so-named for the round metal plate on which it's served, allows for maximum sampling. 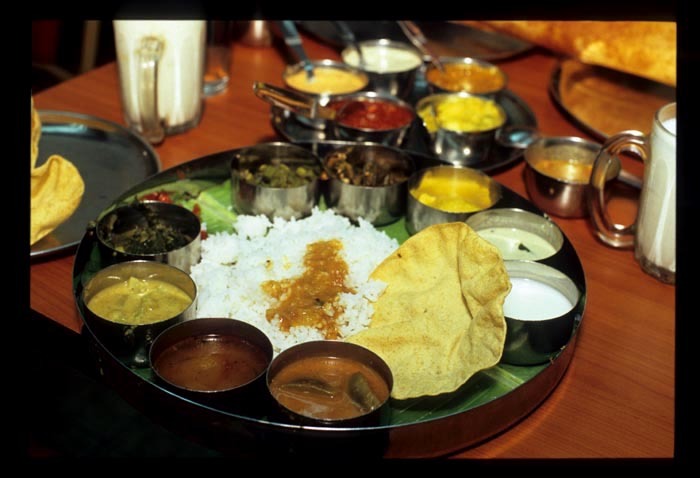 Many of the these characteristic traits of Tamil Nadu cuisine could be found in one or more of the ten bowls that comprised our thali. Two types of yogurt - one plain and one thickened slightly and pepped up with cumin and other fragrant savory spices, complemented diced okra fried with mustard seeds and curry leaves; a thin eggplant curry, spicy and sour from tamarind; boiled turnip sauced with turmeric-infused yogurt; and a thick daal of pureed spinach and onion, among other delights. Our paper dosai, a two-foot-long, almost translucent roll of griddled, crisped dough made from fermented rice batter, was served with additional examples of Tamil flavor: (from top left) a creamy coconut sauce flavored with cumin and mustard seeds; a surprisingly rich (given the absence of meat) sourish curry of mixed vegetables; a chunky and smooth potato 'half-mash' flavored with mustard seeds, curry leaves, and turmeric; a cooked tomato and onion chutney flavored with fennel seeds, very sweet and then, after a few seconds, numbingly chile-hot; and a chutney of fresh chilies blended with coconut, mustard seeds, and other spices. Amazingly the repetetive use of a few spices (mustard seeds, curry leaves, turmeric) didn't translate to repetetive flavors; every one of the fifteen dishes on our thali and accompanying our dosai was unique. 'Only with Indian food can you taste so many flavors in one bite,' our waiter said proudly, and we had to agree. It's impossible to convey in words the many layers of taste we found in each one of these bowls. There's much care taken in the Woodlands kitchen. 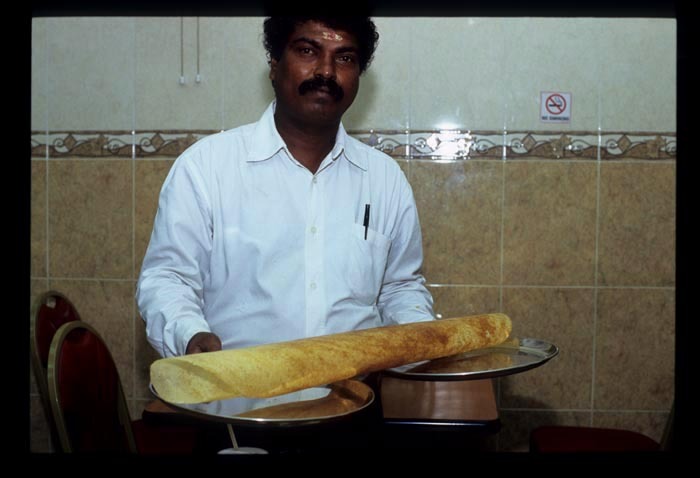 The restaurant's proprietor, known to his staff as 'Captain' (he's the one serving our dosai, above), proudly pointed out the thali dishes and dosai accompaniments that he'd made himself. Many of the daily specials are his doing as well. The extra effort comes through in the food, which is the best Indian we've had yet in Malaysia. 'Does it taste like home?' 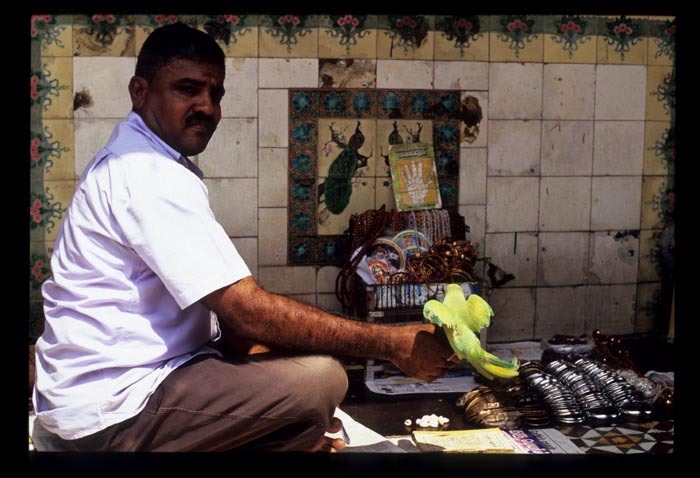 I asked a Tamil Nadu native queuing at the cash register. 'Oh yes, like my mother makes it,' he replied with a grin. 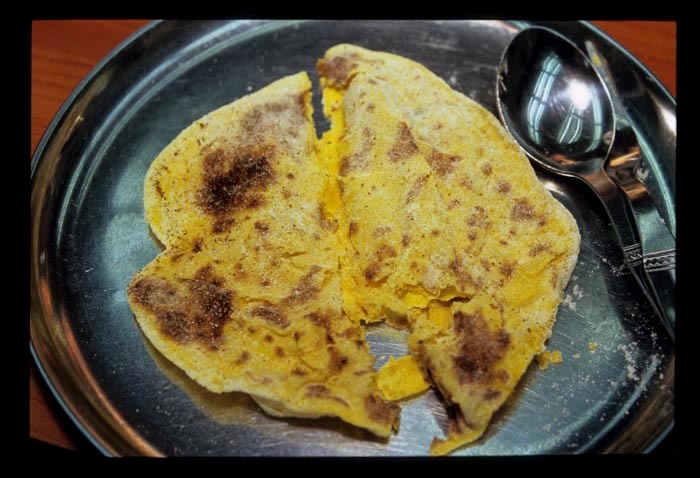 Disappointed to find that our beloved semiya payasam is not a Sunday item, we finished our meal instead with a poli, a feather-light chickpea flour crepe stuffed with mashed yellow lentils. Cardamom, possibly cinammon (Dave and I are in disagreement on this), and a bit of sugar flavored both the dryish, crumbly filling and the top of the pancake itself. 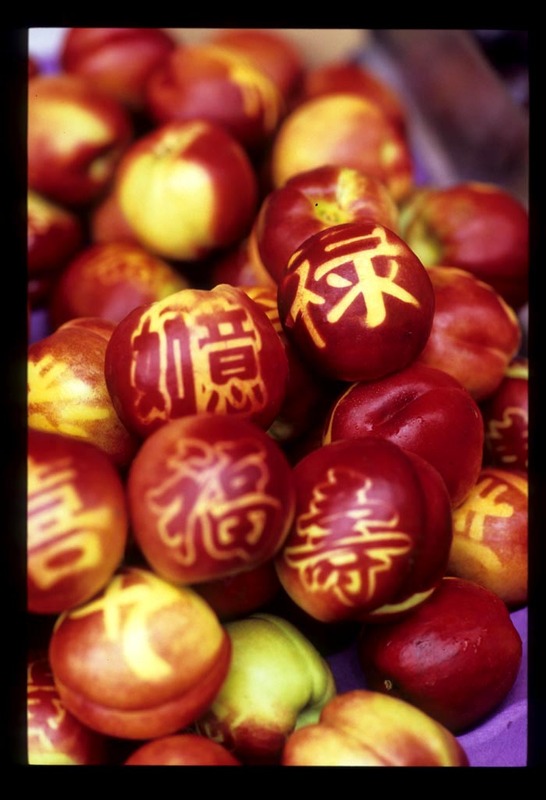 This exquisite, almost sin-free sweet (legumes are good for you) can also be had, on other days, stuffed with dates. A steady stream of customers passed through Bakti Woodlands' doors throughout our long, drawn-out meal. Like us and the folks at our neighboring table, above, they left happy. Bakti Woodlands Vegetarian Food Cafe, 55 Leboh Ampang, Kuala Lumpur. Tel. 03-2034-2399. Breakfast 730-11am, lunch 1130am-4pm, snacks/dinner 4-930pm. Open everyday. I sympathize. 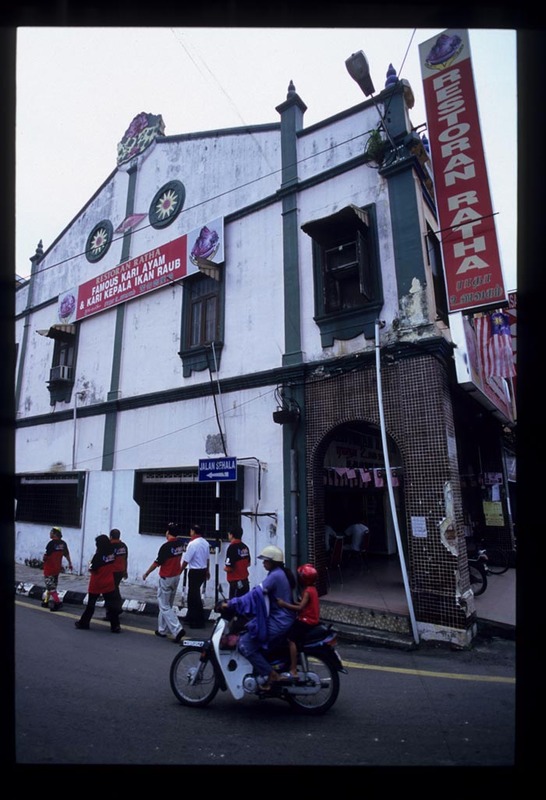 This crop of dated, history-laden buidlings (there aren't that many of them left in KL, anymore) sits in a section of the city utterly devoid of human activity. There's the Tudor-style Selangor Club, windows blackened as if to shut out prying eyes, its green cricket pitch empty. And the concrete expanse of Merdeka Square, site of only of the rare promotional event (or National Day celebration, which must have been something to see before Malaysia's seat of government was moved to Putrajaya), otherwise bleakly vacant. 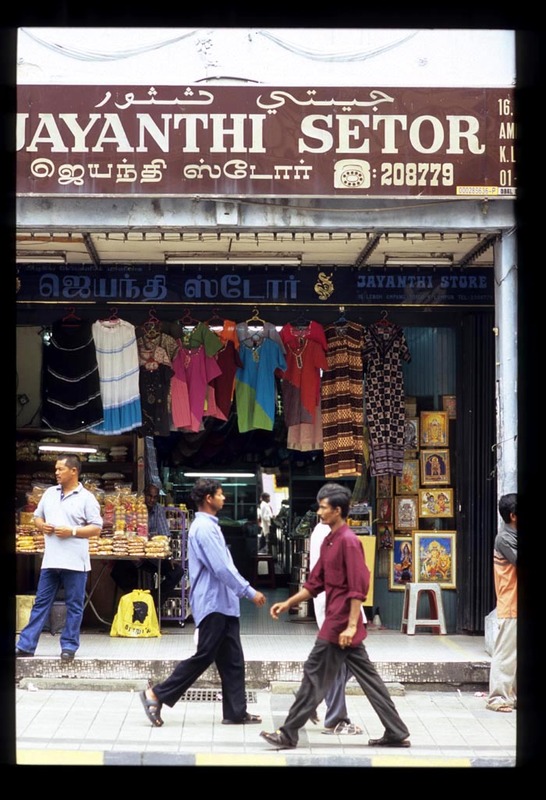 KL's not much of a walking city to begin with; busy, five-lane Raja Laut and the lack of anyplace to stop for a bite or a beverage makes the area even less hospitable to visitors than usual. I want to grab these disappointed folks - the ones who've made the effort to see something of KL other than its shopping malls - by the hand and walk them a couple of blocks north, and east, to Tun H.S. Lee, a street of old Chinese shophouses (many, unfortunately, now vacant or badly renovated and adorned with 'For Rent' signs). I want to sit them down in a plastic chair at an old formica-topped table at Hong Ngek, a typical Hokkien restaurant that's been in the same family, at the same spot, for over seventy years. I want to tell them that the yellowed, peeling paint on the ceiling and the cracked tile walls and the faded, magic-markered menu posted almost too high to read are real, living history, the history of just one of the many communities of immigrants who came to Kuala Lumpur long ago as imported labor and stayed to build their own small businesses - the kind of history that's getting harder and harder to find in Asian cities, the kind that is too often overlooked by travel writers. I'd like to introduce them to Hong Ngek's brusque-yet-friendly proprietor and his daughter-in-law, who will inform them that the restaurant's well-loved sambal, a limey, fishy, surprisingly spicy puree of chiles, is still made according to the original owner's recipe. I'd encourage them to solicit his and her opinions about what's best to eat. If my rescued tourists were lucky they'd end up with stir-fried dongfen (bean thread noodles) and sweet and sour pork (a rice dish and a noodle dish, 'for variety'). 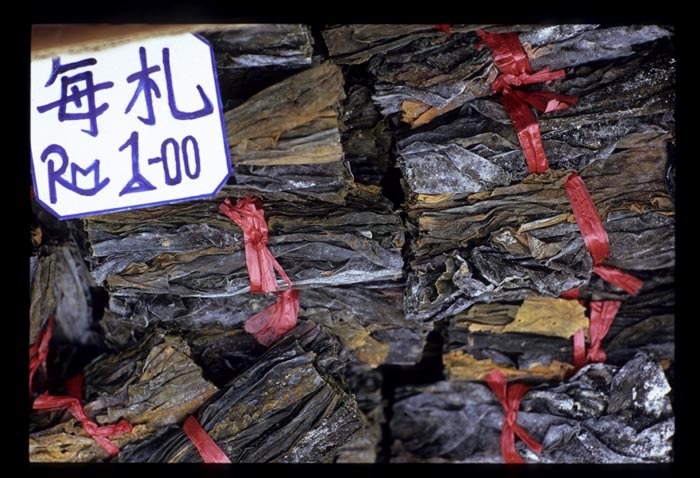 The dongfen would be smoky from the wok that's given birth to thousands and thousands of previous orders. Just kissed with oil, the noodles would be twined around that 'Chinese-tasting' combination of Napa cabbage, pork, shrimp, scallions, bean sprouts, egg, and soy. They'd be pleasantly toothsome and completely comforting. 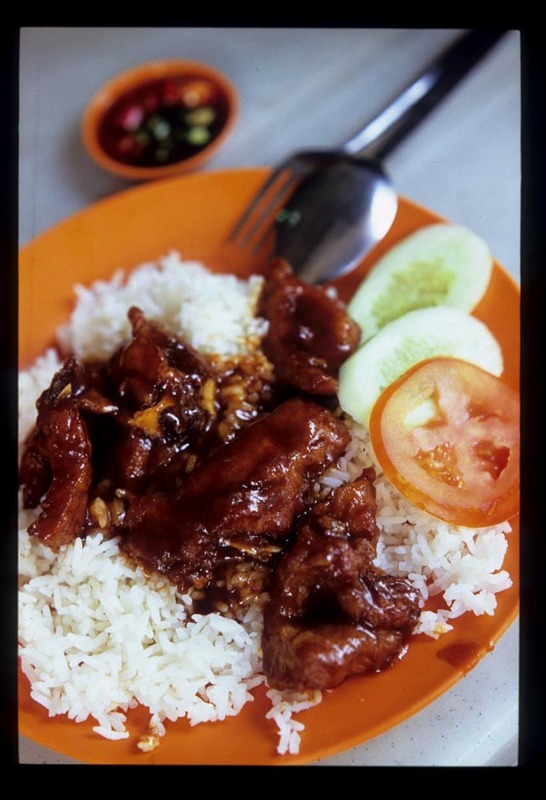 Hong Ngek's sweet and sour pork would be a surprise, at least for anyone who's familiarity with this southern Chinese dish (Hokkien/Fujian is a province on China's southeast coast) extends only to the poorly executed versions standard at American-Chinese restaurants. 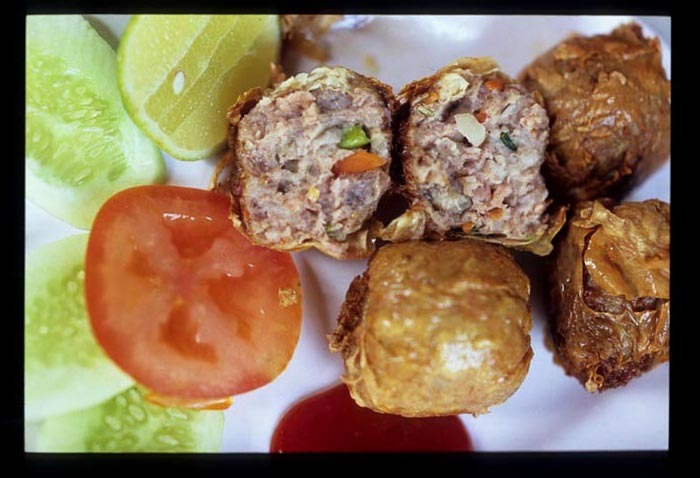 The pork, deep-fried to a non-greasy crisp, would be in big, meaty, two-bite pieces, and the sauce, as tartly sour as sweet, would contain not a hint of gloppiness. The taste of the meat would hold sway over other elements in the dish and there'd be no fruit - no pineapple, no tomato - except on the side, as a garnish. If my companions were adventurous, they'd take a stroll around the restaurant to see what other tables held. They might spy these delectable crab balls - a mixture of crab and pork, really, and slightly crunchy carrot and Chinese celery, the whole mix touched with a hint of nutmeg - wrapped in the thinnest tofu skin and deep-fried to golden. They'd be crazy not to place an order. Sitting at their table near Hong Ngek's entrance, these tourists might be approached by a couple of sprightly ladies of a certain age heading out for a spot of shopping after their weekly lunch. They'd be surprised to learn that one of these women, who's probably someone's grandmother, plays football and cricket, and enjoys a good workout at the track. They'd welcome these seasoned regulars' advice to return to Hong Ngek soon for the 'wonderful' sweet and sour fish, soup on the side. 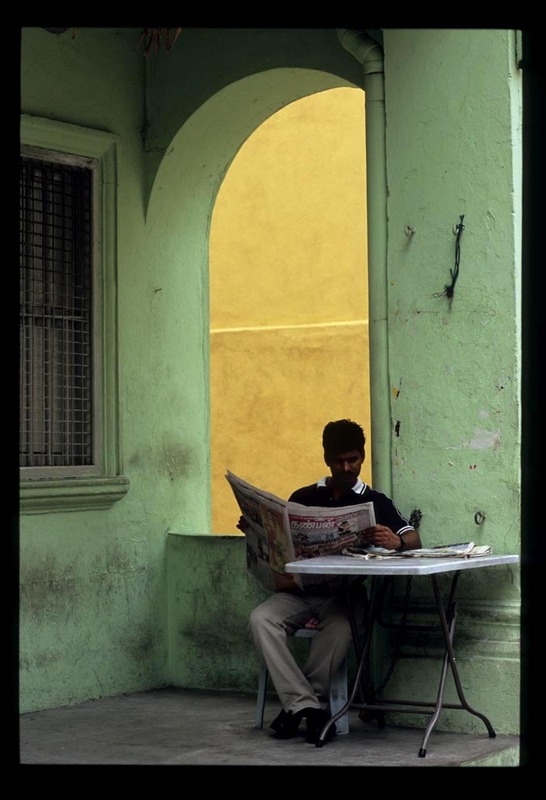 And, they might leave Hong Ngek with something that a roll of photos of Merdeka Square, the Selangor Club, the Industrial Court, and the sanitized Central Market could never offer - a sense of Kuala Lumpur as a city of neighborhoods, of anonymous lived lives and personal, rather than famous, histories. The most mundane, but interesting, histories - the kind the guide books rarely tell. 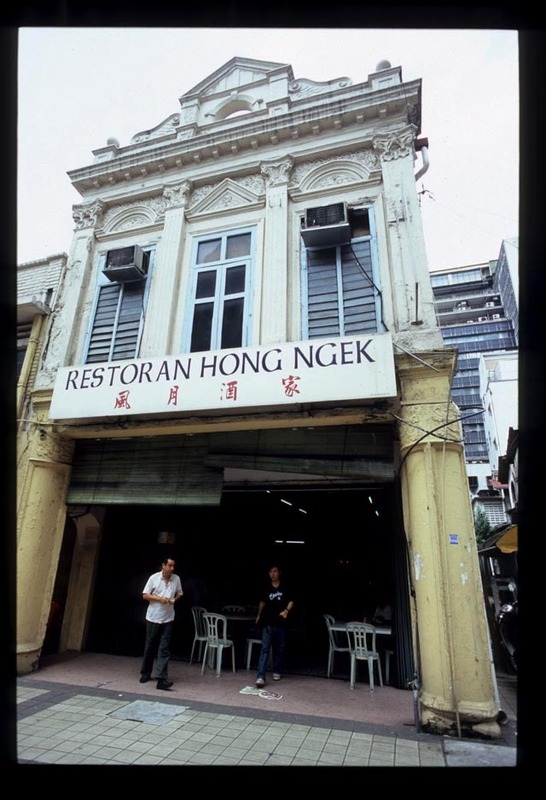 Hong Ngek Restaurant, 50 Jalan Tun H.S. Lee (aka Jalan Bandar), steps from Jalan Tun Perak, Kuala Lumpur. Tel. 03-20787852. 1030am-7pm (5pm on Saturdays). Closed Sundays and public holidays. 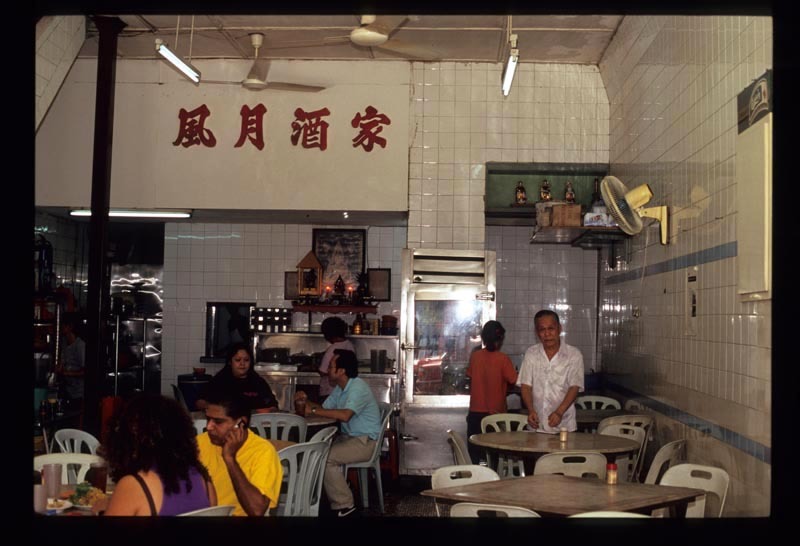 We're sad to learn that the days of Hong Ngek's crab balls are no more, according to reader Pete, who reports that "Hong Ngek today no longer offers Xinghua Hokkien food, but one-plate "dai chow " dishes which KL's office workers in that area look for."